In our experience, illnesses of the crop are the biggest cause of poultry deaths, so knowing what you're dealing with when your chicken is off her food and moping can save her life. The crop is a muscular pouch used to store food waiting for digestion. It is located on the right side of a bird's lower neck or upper breast area. All birds have them. A healthy crop is loaded with lots of good bacteria so when food sits in this pouch for hours on end, the good bacteria keep the food from growing toxins and harmful bacteria. As the gizzard grinds up all the grass, weeds and roughage the bird just ate, the crop slowly contracts and pushes small amounts of food down through the tube toward the stomach, through the gizzard and on through the intestinal tract. When running properly, it is a very efficient system, with the crop playing a huge roll in the entire digestive tract. Sometimes the crop malfunctions which causes distress, illness and sometimes death to the bird. Food and waste need to keep moving through the system for the bird to take in nutrients and expel waste. If the intestinal tract shuts down, the bird can die. How do you know if the bird has a crop issue? A bird that has a healthy fully functioning crop will always wake up with an empty crop and go to roost with a full crop. Birds like to stuff their crops full a few hours before roosting so they can get through the night with enough calories to stay warm and alive. It takes about 4 to 8 hours to completely empty the crop. If the bird has been developing a crop issue that has gone unnoticed by you for some time, you may find the bird sitting in the corner looking sick and by examining the bird, you find he or she has a full or gassy crop. However remember, other illnesses can cause the crop to stop working, so you will need to do an overall examination of the bird to try to determine why the bird has this crop issue and what needs to be done to treat it. Daily checking on your flock is always the best way to keep them in good health. Along with the comb colour, the activity level of the bird, whether he or she is eating and drinking well, regularly checking the crop is a good way to monitor the health of your birds. Many illnesses can be prevented or cured quickly if caught early enough. Give your birds a crop check daily each morning before they have eaten or drunk anything and in the evening at roosting time as well. This way you will know if the bird is eating enough. Crops should be full at roosting time. If they are empty, there is something going on with the bird. If there is something in the crop in the morning, again, something is amiss. If you are keeping regular tabs on the crop, you could potentially save your bird's life having gotten treatment going early enough. Sour Crop is a yeast infection caused by too much bad bacteria and yeast growing in the crop, from it emptying too slowly over a few days. Slow and sour crops can be caused by many things such as feed changes, indigestion, feed that has gone off, mouldy or bug ridden, and drinking from contaminated puddles. Sometimes a slow or sour crop is stemmed from something more serious like internal infection, organ failure or the bird is simply dying. Generally when a bird is near death, the intestinal tract has shut down and liquid is filling these cavities. These birds are often easily spotted as they are sitting in a corner of the hen house, eyes closed and barely conscious, very dark red or purpley coloured comb and not responsive. In this case, the best thing you can do is move the bird to a warm soft place and make the bird as comfortable as possible so it can gently pass away, or humanely put her down. The most obvious signs of sour crop is a yeasty or vinegary smell coming from the mouth and an enlarged crop that feels squishy and fluid-filled when you lightly squeeze it. An affected chicken becomes lethargic, stops eating, and in a severe case may die. Treatment is not always successful. The first thing you need to do is get this gunk out of her crop or it will become toxic very quick and poison her. Since chickens can't vomit, you will need to do it for her. Hold her like a rugby ball under one arm, beak facing forward. With your other hand, support her at the crop. Stand yourself with feet apart and lean yourself and the bird forward, beak facing the ground, tail up. Gently squeeze and massage the crop to drain out the contents. The moment the fluid starts to come up out and out of the beak, hold her for no more than two seconds in this position and then stand her and yourself back up. Any longer and you run the risk of her inhaling regurgitated crop contents and drowning. Separate her from the flock in a cage for observation. Epsom Salt flush: 1 teaspoon Epsom Salts per cup or 4 teaspoons Epsom Salts dissolved in 1 litre of drinking water as the sole source of drinking water for one day. Follow up by treating with Acidified Copper Sulphate in the drinking water for three days at a rate of 1/4 teaspoon per 3.8 litres water. This is a very effective remedy for clearing up the most wicked yeast and fungal infections. Always use the acidified stuff. This is an item you should always have on hand in your poultry first aid kit, as you never know when you might need it in a hurry. The crop being a muscle, works with the good bacteria in the entire system and when there is not enough of it, the crop slows down. It can even stop completely. So keeping food in the crop is important to keep it moving and help to replace all the good bacteria that is naturally there. But you can help to replace it quicker by offering Probiotics. 70% of the immune system is in the intestinal tract of all animals. You can use human grade probiotics. Empty one capsule into one litre of drinking water. Make up a fresh mixture daily. It helps to dampen the feed with some water which helps to break it down easier and keep the crop moving as fast as it can in it's condition. No hard seeds or grains. She can eat some chopped hard boiled egg mixed with a little unsweetened yogurt. It has wonderful qualities of good bacteria and protein. Do not use sweetened yoghurt, as sugar feeds the yeast and will make it worse. Each morning you will need to check her crop for fullness and vomit her if necessary. The bird needs to stay hydrated and fed. Only vomit during the day if she is leaking a lot of fluid from the beak. Fluid leaking from the beak can also happen after a bird drinks too much water, so don't confuse over drinking of a healthy bird for a crop issue. Once the bird is eating and pooping normally and seems to have perked up, you can assume you have cured the bird of this issue. She can then go back to her regular activities. The impacted crop will be enlarged and hard like a baseball. This is caused by an obstruction such as hay or coarse grass stuck in the crop, preventing feed from entering the digestive tract and forming a large blockage. If left unchecked, the food in the crop will start to rot and become toxic and your bird will die from poisoning. Drop 2ml of red wine into her beak or dip her beak into a small bottle cap containing the wine. This will get things moving fairly quickly. Keep her caged for observation so you can monitor her poop output and see that the impaction is passing through. All she can have is water for the day which will help break down and move the hard ball. Dissolve 1 teaspoon of Epsom Salts per cup of warm water. This will help to prevent bad bacteria from multiplying. It is also a laxative and will gently cause the entire gastrointestinal tract to contract to help move all this gunk out of the system. After about 4 hours the pooping should start. The more she poos, the smaller the crop should become. Give some olive or vegetable oil onto the bird's front or middle tongue as you hold the head level, allowing her to swallow after each drop. Never squeeze anything into the beak with the head back or deep into the throat as this will aspirate (drown) the bird. If you are unable to get her beak open, you can offer about a tablespoon of mashed hard boiled egg with the olive oil. Make sure she eats it all. Gently massage the enlarged crop to break up and move the impaction. You may feel the size slightly decrease and become more malleable as you do so. At roosting time, let the bird roost with her mates and in the morning check her crop again. The crop should be empty or nearly empty. Keep her on light, moist foods, no hard foods or anything that might cause more trouble. Check her crop the following morning, the crop should be completely empty and back to functioning properly. Have you wormed your birds lately? Worms can over-populate the intestinal tract to the point of blocking off the entire passage, causing the crop to become impacted. Has the bird been laying regularly and possibly is she egg bound, causing the crop to become impacted? Did your chicken get into some deep long grass, freshly mowed grass or some stiff vegetation? Long grass can wind into a ball in the crop and become difficult for the bird to move and can also cause a gizzard or intestinal impaction. So keep your grass cut short. These are the most common reasons a crop becomes impacted. Generally these procedures move the most stubborn blockages. Having oyster shell grit readily available will help prevent impacted crop. 1. The Crop has become dehydrated due to a blockage. 2. This is a yeast infection and you are feeling the growing yeast. 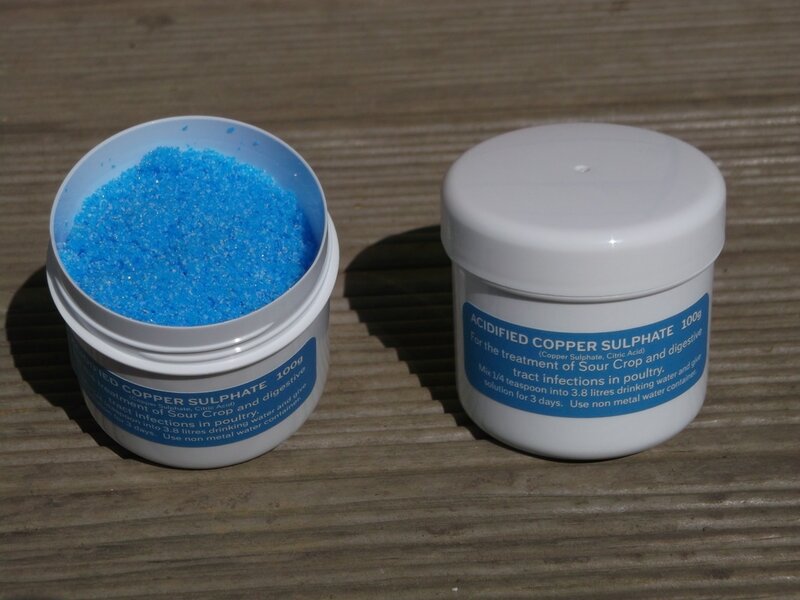 Treat with a solution of Acidified Copper Sulphate over a three day period and gently massage the mass to help break it down. ​* Regular crop checks in the mornings and at roosting time. * Add Mineral Boost to their feed. This is loaded with probiotics which will help prevent bacterial imbalances. * Apple Cider Vinegar or Stockman's Friend, given in drinking water for three days, once a month can help to raise the PH level of the entire body. When a crop is slow or sour, the PH of it is low. ACV goes in as an acid, but as the bird digests it, it turns the body more alkaline. 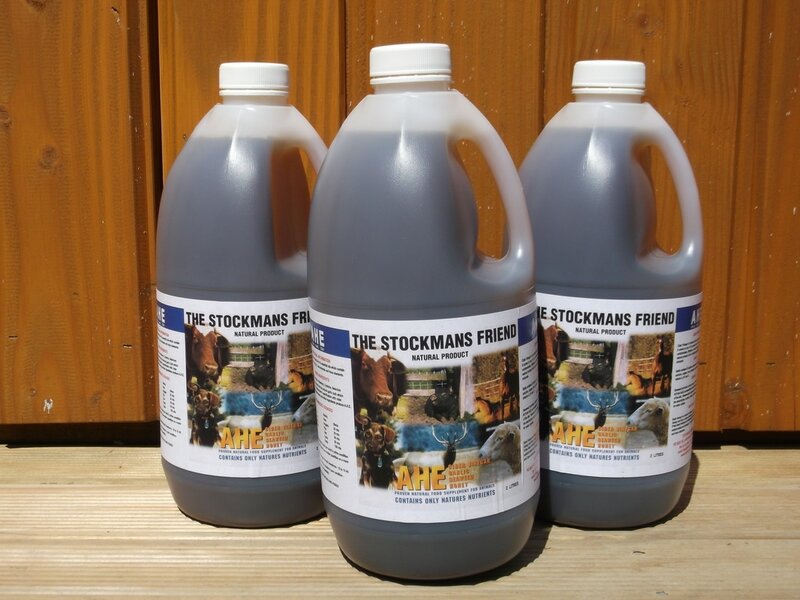 Stockman's Friend is a great tonic to keeping your bird healthy and the crop in good shape. Over time, the PH of the body will rise with a once a month treatment. * Be careful with feed changes. Just as we humans get indigestion, so do birds. Small things like this can throw off the good bacterial balance in the crop and intestines. So mix in new feed gradually. * WORM your birds! 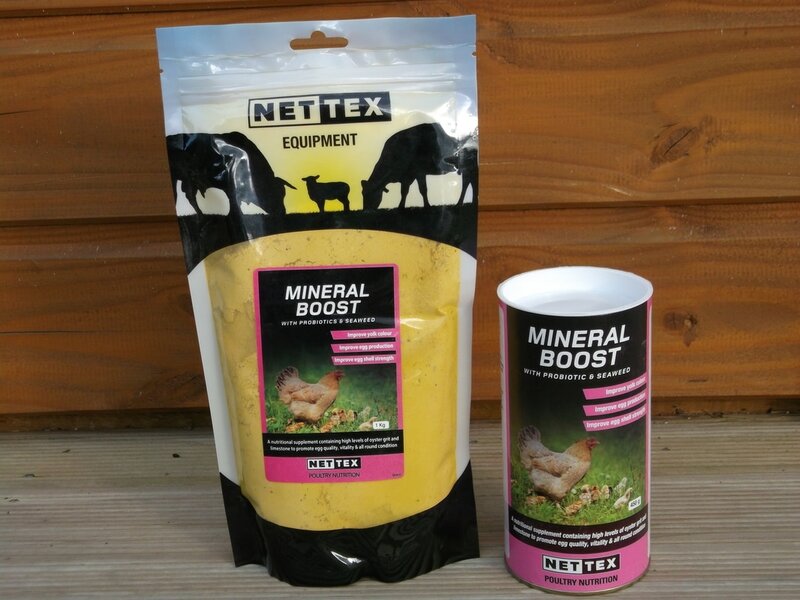 This is vital to keep your birds intestines free from worm impactions. Worms will drain the life out of a bird and can block the entire intestinal tract up completely. * Keep your grass cut short. Long thick grass can wind up in a crop and block it. * Avoid too many hard to digest treats such as raisins and peanuts. They can be hard to break down or contain too much sugar. * Have grit available at all times. Grit is very important for the gizzard to grind up all hard foods. Gizzards are also a muscle and need to develop strength over time to be able to grind up all these hard foods.